Fidalgo Island is perhaps best known as the home of the Anacortes Ferry Terminal—the jumping-off place for the San Juan Islands and Victoria, British Columbia. Birding cognoscenti, however, recognize the island as a fine and varied birding destination in its own right. Any or all of the sites described here are often included on a visit to Whidbey Island or to the Skagit and Samish Flats. Go 2.6 miles west on SR-20 from the traffic light at Bay View-Edison Road (north side of SR-20; south side is La Conner-Whitney Road). This intersection is also known as Farmhouse Inn corner. This will take you across the Swinomish (pronounced SWIN-ih-mish) Channel bridge onto Fidalgo Island. You are now on the Swinomish Indian Reservation. Turn right at the exit for March Point and then immediately right again onto Casino Road. At 0.1 mile you can pull off on the left (north) side of the road along Swinomish Slough, best viewed at low tide, to look for Semipalmated Plover, both species of yellowlegs, and other shorebirds. Return to a stop sign, turn right, and continue 0.8 mile to a sign reading Casino Road. Turn right onto this road (called East March Point Road on some maps), cross the railroad track, and pull off immediately on the right to check the several dredge-spoil islands, home to a colony of Glaucous-winged Gulls. Caspian Terns are regular summer visitors. 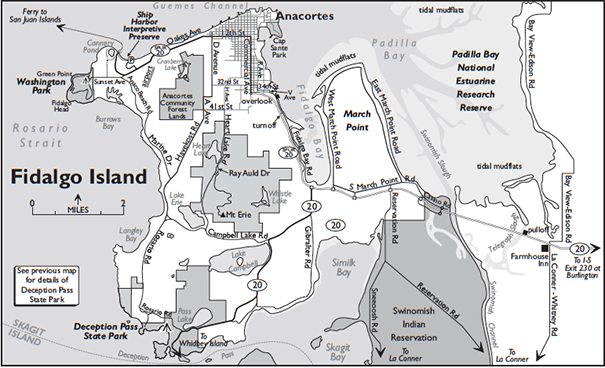 A peninsula between Fidalgo and Padilla Bays, March Point is home to two major oil refineries. The tank farms and cracking towers at your back form an odd contrast with the spectacular natural scenery of Padilla Bay, Mount Baker, and the Cascades. Drive up the road along the eastern shoreline to the tip of the point, pulling off when there’s an open view to scope the waters. Loons, grebes, cormorants, and several species of diving ducks are common here, especially from November through April. March Point is a good place to view Gray-bellied Brant (see also page 114). Check the refinery piers for Black Turnstones. Black Scoter is rare in Fidalgo Bay; Sanderling, American Pipit, and Snow Bunting are occasionally observed on the pebbly beaches. Continuing around the point, West March Point Road completes the loop back south to SR-20 in 5.7 miles. Turn right and continue west about one-half mile. Here SR-20 turns left (south) toward Deception Pass and Whidbey Island. Stay straight onto SR-20 Spur, travel 2.7 miles, enter the roundabout, and turn right onto Commercial Avenue (SR-20 Spur). Continue into the Anacortes business district. At 1.2 miles, turn left with SR-20 Spur onto 12th Street. If you are tempted by a panoramic view of the entire area covered by this chapter, with some good forest-birding possibilities thrown into the bargain, an excursion to Mount Erie will well repay the one-hour round trip. (To maximize your investment, choose a sunny day.) After heading west on 12th Street from Commercial Avenue, in 0.8 mile turn left onto D Avenue. This arterial jogs right, then left, becoming A Avenue. In 1.9 miles, turn left (east) from A Avenue onto 41st Street, then right in another 0.5 mile onto H Avenue, which continues south as Heart Lake Road. After passing Heart Lake on your right, turn left in 1.4 miles at the sign for Mount Erie Viewpoint. The 1.8-mile road through 1,400-acre Mount Erie Park ends at the 1,273-foot summit. Along the way, species to look for are similar to those for the wooded habitats of Washington Park (see below). There are four vista points, and by visiting each one you can see south the length of Whidbey Island and Puget Sound to Mount Rainier in the distance; southwest to the Olympic Mountains and the Strait of Juan de Fuca; northwest and north across Rosario Strait to the San Juan Islands, Vancouver Island, and the Coast Mountains of British Columbia; and east to the Cascades, Mount Baker, and the Skagit and Samish Flats. Return to the intersection of D Avenue and 12th Street, turning left onto 12th Street, which soon becomes Oakes Avenue. In 2.3 miles, at a right turn for the ferry terminal, continue straight ahead on Sunset Avenue to the entrance to Washington Park (0.6 mile), an excellent seabird viewing site from late September through mid-April. The one-way, two-mile loop road through this popular park starts just past the camping area. If you are driving, pull off on the left at Green Point, about 0.7 mile from the park entrance, to scope Rosario Strait and the west entrance to Guemes Channel. Note: the loop road is reserved for walkers, runners, and bicyclists up to 10AM, when it opens to automobile traffic. Naturally, the best viewing times are from early to mid-morning before the crowds arrive and with the sun at your back. At these times, the third-to-half-mile walk to Green Point from the parking area is worth the small effort. Take your scope. Three species of loons (Red-throated, Pacific, and Common) and three of grebes (Horned, Red-necked, and Western) are seasonally common, as are Common Murres, Pigeon Guillemots, and Marbled Murrelets. Rhinoceros Auklets are present in large numbers from July through October. In November and December, this is a good location to seek Ancient Murrelets. Harlequin Ducks and Black Oystercatchers are frequently seen along the rocky shoreline. At dawn, hundreds of Brandt’s, Double-crested, and Pelagic Cormorants move up Rosario Strait to feeding areas. Another good pullout is 0.2 mile ahead. Farther along the loop road (0.3 mile), a set of stairs leads to a rocky beach and more oystercatchers. The road weaves its way through a typical low-elevation forest of Western Hemlock, Douglas-fir, and Pacific Madrone—the beautiful understory tree with old, red peeling bark and young, smooth chartreuse bark. Stop often to walk the numerous trails, looking and listening for year-round resident species such as Red-breasted Sapsucker, Hutton’s Vireo, Steller’s Jay, Chestnut-backed Chickadee, Pacific and Bewick’s Wrens, Golden-crowned Kinglet, Spotted Towhee, and Purple Finch. During migration and summer these may be joined by Rufous Hummingbird, Pacific-slope Flycatcher, Black-throated Gray and Townsend’s Warblers, and Western Tanager. The loop road ends back at the main parking and picnic areas. From the end of the loop road, drive out of the park along Sunset Avenue 0.7 mile to a stop light (Sunset ends here). From the stop light continue straight ahead on Oakes Avenue (SR-20 Spur) for 0.5 mile and turn left onto Ship Harbor Boulevard (Glasgow Way on some maps). In 200 yards turn left at the T-intersection onto Clipper Drive, which becomes Edwards Way. Follow Edwards Way downhill 0.2 mile, where it dead-ends at a cul de sac parking area. A paved section of the Guemes Channel trail extends east approximately one mile along Guemes Channel and provides opportunities to view loons, grebes, cormorants, a variety of waterfowl, and Pigeon Guillemot. This trail section is wheelchair accessible with trailside interpretive signs. Better birding can be experienced along the trail going west leading into Ship Harbor Interpretive Preserve. This trail leads to a boardwalk suspended over a wetland with multiple observation platforms and beach access. The trail ends at the ferry terminal, approximately 0.2 mile from where you parked. Within the preserve you can see a seasonal variety of waterfowl (among others, Eurasian and American Wigeons, Cinnamon Teal, Long-tailed Duck, both goldeneyes, Hooded Merganser) and gulls (Bonaparte’s, Heermann’s, Mew, Thayer’s, Glaucous-winged) as well as Virginia Rail, Sora, Anna’s Hummingbird, Violet-green Swallow, Marsh Wren, and Common Yellowthroat. Look in the saltwater channel for scoters, loons (Yellow-billed recorded), grebes, cormorants, and Pigeon Guillemot. A highlight is a colony of Purple Martins that nest in the boxes provided; Osprey are also found nesting on the platforms at this site.